I grew up watching Funny Face, draping myself and my friend Katherine in fabrics, and twirling our way around the living room to “Think Pink.” Maybe that’s where I can put the blame for my fluffy petticoat fascination, and my unusal attraction to 50s high style clothing. For some reason, however, there is a shocking lack of them in my personal wardrobe! I always considered myself too figure-less to pull off the 50s. But darn it, if Audrey could do it, I can do it. My recent fascination is with the late 50s mode of dress. I think it could be not only extremely flattering if done correctly, but also pretty wearable in the modern day, without looking like wearing a costume. And then we have this. Oh dear. 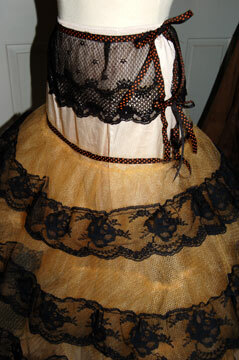 A recent fabric impulse buy of orange oraganza flocked with black halloween kittes needed a petticoat. Our local fabric store had a fun orangey-gold in tulle for cheap (for reference, I bought 7 yards), and I raided the stash of doom for black lace, and picked up some polka dot grosgrain from Michaels. I had a 50s petticoat pattern at one time, but it went MIA, so I dug around in my pattern stash and found a modern McCall pattern, number M5141 (looks like it’s out of print now). 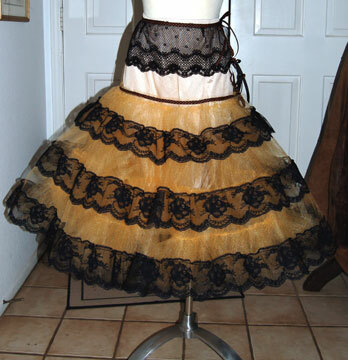 Sure, it’s SUPPOSED to be a skirt, but I wanted a fitted yoke and full skirt, so it was perfect. I cut the skirt on the highest line for trim since the length was too long and luckily they had several lines running parallel to the hem. I cut two, actually- one to add rows and rows of ruffles to, and one to lay over the top. Originally I was going to leave it all the same color, then the dig in the lace stash gave it more “pop”. And then I snagged a massive hole in the yoke so it got more lace up top. And then I couldn’t figure out how to fasten it so it got ribbon ties. Oh well, it’s underwear, what do you want? And I still think it came out cute, despite some unintentional “fixes”. 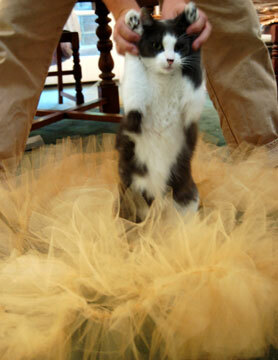 Of course, no mention of tulle can be made without mentioning my cat, Mr Charles, and his un-natural attraction to tulle. I brought out the fabric from the bag, and like a moth to flame he was instantaneously drawn to it and sprawled himself out. I tried to fold it to cut and he batted at it with his kitty paws. I cut strips and started sewing some, and he had possesed the entire awaiting pile as his. I started sewing some of the ruffles on and I looked down to see the ruffles were now his. I started on the lace and left the under “poufy” aside, and he had made it his home. When I was finished I went down the hall for the dress form and I got the lovely last image here as a welcome back. >Oh my gosh such cute pictures!!! >I need a pettycoat in the worst way! I want a black or aqua one. >Oh, Funny Face is such a great movie :)Love petticoat. Such cute pictures, your kitty is so adorable! >That is awesome! Your post made my day! Thank you and your Mr. Charles, as well! 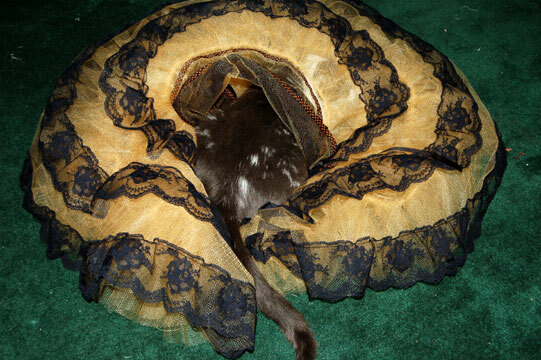 >So funny – my kitty Reggie is obsessed with my crinolines too. 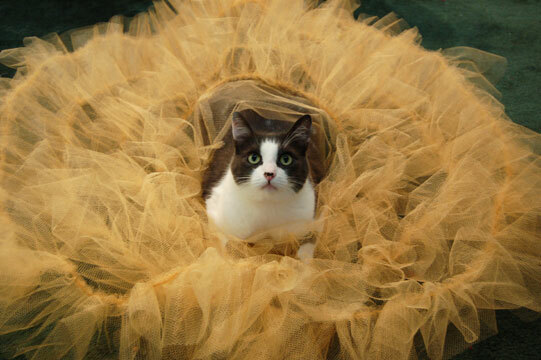 His favorite thing in life is to lay in a giant pile of my crinolines, peaking out from underneath the layers of tulle. Lucky cat, I indulge him from time to time!